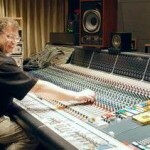 Tags: Audio mixing EQ tips, Live band recording. 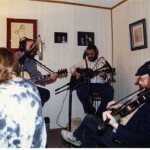 This post will highlight all possible ways on how you can improve the sound quality and clarity of your band practice. Have you noticed that if you are doing band practice whether at your friends’ garage, the overall sound is lacking in clarity despite of the loudness? For example, you noticed that vocals get drowned overall as a result you can hardly hear the vocals despite all the screaming and maximizing the vocal volume. Also have you noticed that drums are so very loud that it can mask all the band instruments sound? Lastly have you observed that the deep bass guitar lines are not even clear and are masked because of loud guitars/drums? Why the band rehearsal practices sound so muddy? The root cause of this problem is that the audio frequencies of different musical instruments are not well mixed together. As a result, one instrument tends to dominate another in the same frequency range and the one with lower volume will be likely masked or deeply buried in the overall resulting mix. 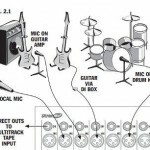 Unfortunately not all bands can afford an expensive audio mixer (which can solve this problem easily) and a sound engineer for every band practice. 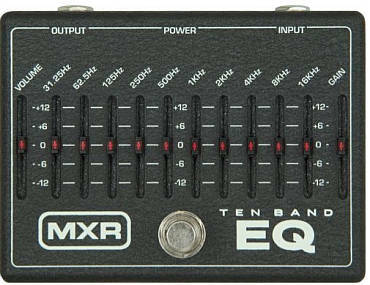 This tutorial will primary focus on EQ adjustments made directly on your guitar amplifier cabinet or guitar/bass EQ pedals which are also common, such as the MXR 10-band graphic equalizer . These EQ pedals can also be implemented on live vocals. 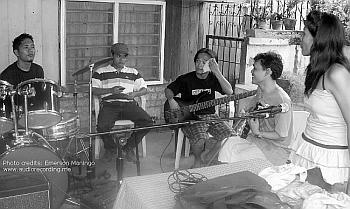 Snare drums and other drum parts are an exception because in small band practice setup; there is no need to put microphones on drums since it is already loud. a.) 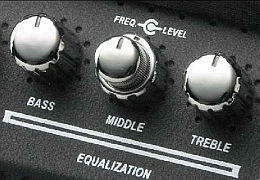 Lower down the MIDDLE equalization setting of guitar and bass amplifiers to around 0.3-0.5(preferably less than half). This will cut the middle frequency elements of the guitar, creating a hole in the middle frequency range for the vocals to sit nicely in the mix. c.) If you have EQ control for the vocals, boost +3dB on 500Hz, 1000Hz and 2000Hz. This will drastically improve vocal clarity in the band practice. If you have EQ control for vocals, cut -6dB on 125Hz, 62.5Hz and 31.25Hz. To improve guitar distortion heaviness clarity particularly for rock bands, boost +3dB using EQ pedal on 250Hz and 4 KHz. To further improve deep bass guitar clarity, boost +3dB on 31.25Hz, 62.5Hz using an EQ pedal. 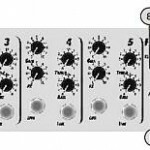 Or using bass guitar amplifier EQ knob, switch the bass control to 0.75 to max. Finally, let the band play a song. Use the volume settings on all amplifiers to finally balance the volume of all instruments. 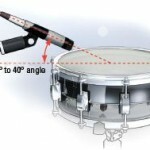 Since drums will be louder, it is advisable for the drummer to be in “dynamics” and “comparable in volume” with the rest of the musical instruments for the EQ settings to work its magic during band practice.